Danae article offers ways to find faults in the grinder various models of angle grinders and repair (angle grinder) their own hands. 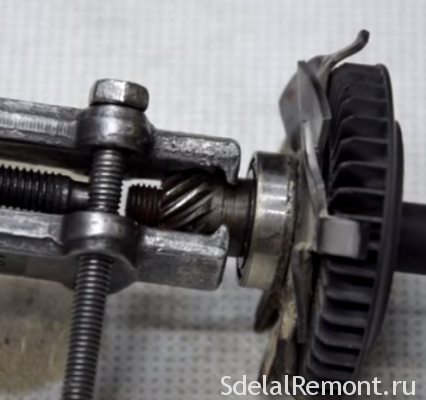 Here you can find answers to questions on the order of disassembly gear bolgarok most popular models, replacing the gear cogs, bearings and their repair. The recommendations on the order of pressing and pulling out the gears and bearings, repair methods and tools. Along with common faults in angle grinders of different brands available and their features. This is not only the differences in the designs of Bulgarians, but also on the materials and components. Important to, who made tool. Knowledge of the Bulgarians in the design allows for angle grinders repair their own hands quickly and qualitatively. The information below will help to repair any brand Angle grinders. Along with original instruments, construction market is flooded with cheap imitations. And do not think, that fakes are made exclusively in China. Power of Chinese manufacturers for quality are as good as manufacturers of the European countries or the countries of South-East Asia. Quality Chinese manufacturers of tools for the European consumer are several input control stages. For third countries, Chinese manufacturers do not perform tool monitoring. But the tools are made on the same lines, the same factories, Threads same people. That is why such a difference in price. To repair the Bulgarians with their hands, it is necessary to have a scheme of the LBM and understand it. 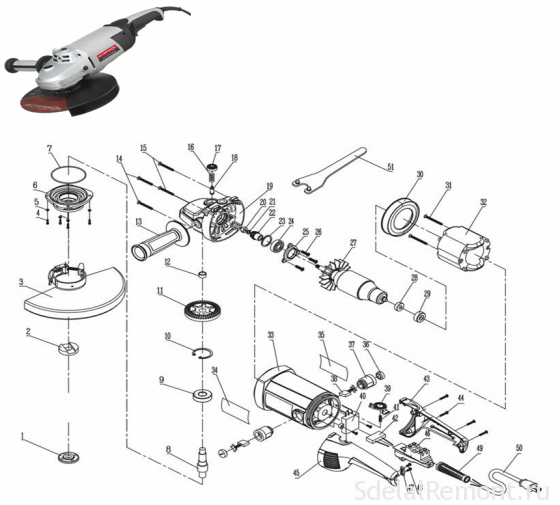 Repair Bosch grinder is different from repair grinders Interskol. And then there are the Bulgarians under the brand Makita, Hitachi, Metabo. 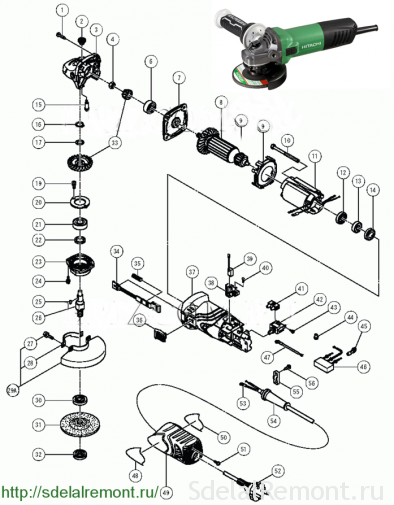 Before starting the disassembly of grinders, carefully read its description, circuit assembly and work order. Be sure to follow the sequence of technological operations. The most common cause of breakage grinders - wire break is near the handle. First you need to check the presence of voltage on the button, it is done in the usual voltage tester. Then check the button itself on the performance. In details diagnosing and repairing electrical grinders. various bearings used in gearboxes bolgarok. They are subjected to heavy loads and are the cause of the fault. The destruction of the bearing is determined by the increase in backlash spindle shaft. Dismantling the gearbox housing and remove the shaft of the large gear, you will see the needle bearing. The needle bearing is not applicable in all Bulgarian. In the same grinder, in which it is installed, its dismantling can be done in several ways. After removing the ruined part of the bearing, the inner ring can get using machine tap. Clamp machine tap suitable diameter in the screwdriver chuck and try it in the screw bearing race, until the tap touches the bottom of the housing. Continue to slowly twist the tap in the clip. He will lift the clip on a thread. The second way is, What remains of the destroyed needle bearing cage can be removed using spetsbolta and retaining ring. Repair gear grinders begins with the dismantling of helical gears. It gears are a major cause of malfunctions gear grinders. The grinders often have to change a small leading gear, mounted on the rotor shaft. The pinion keyed fixed and clamped by a nut. The pinion is mounted by means of a threaded connection. It is used as a right, and left-hand thread. The pinion is pressed onto the shaft. The pinion is mounted by means of key connection. In addition to replacing the gears in the grinder is often required to replace one or the other bearing. And them in the Bulgarian construction at least three. 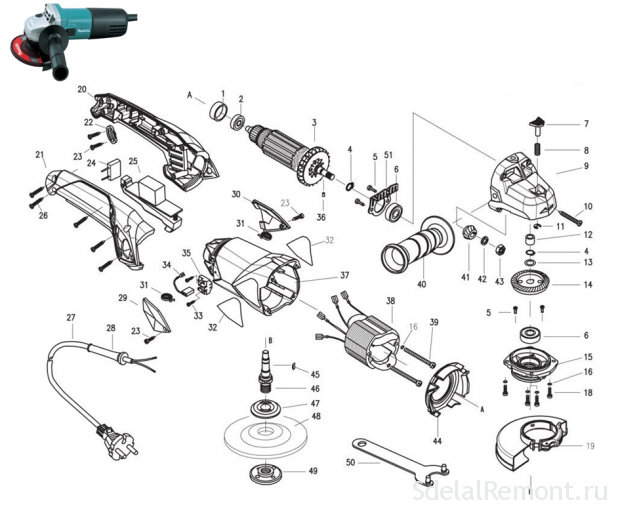 In this section we consider the design features bolgarok, produced under the brand Bosch, Hitachi Makita и, LBM as well as repair their own hands. Bosch grinders are a reliable tool, does not cause much trouble to the user. But not every user is assigned to the tool correctly. Repair Bosch angle grinders often paired with the replacement of the bearings. Structurally all grinders Bosch performed by the same scheme. poz.25 spindle shaft is pressed into the driven helical gear at 26 and is supported in the gear housing on the needle bearing poz.821 poz.51. With the destruction of the bearing within the housing is a bearing cage, which is not easy to get. 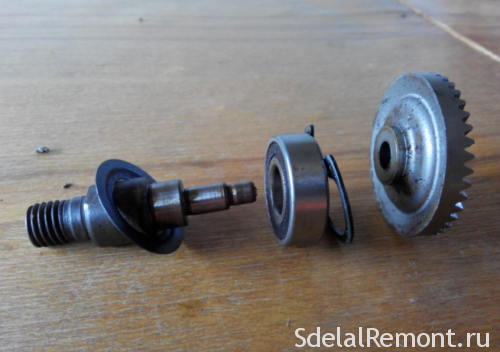 We recommend two ways to dismantle the cage needle bearing. They are described in the section "How to remove the needle bearing». When worn or licking of teeth of pinion pairs replacing only both be pairwise. Dismantle gear, remember, that the drive gear is mounted on the rotor shaft threadably, wherein LEFT and fixed nut. Driven by large helical gear at 26 is pressed onto the spindle shaft poz.25. Particularly popular among Russian consumers received grinder Hitachi. And it is natural. In the market there are practically no fake artisanal bolgarok Hitachi. simple design makes it easy to carry out repairs of any complexity. Hitachi's grinders have increased reliability and rarely fall on the table repairmen. The main reason for getting Hinachi grinders for repairs - Faulty gear, namely, production gear teeth. Understands reducer grinders just. To disconnect the gear housing pos.3 poz.37 from the stator housing, it is necessary to release the carbon brushes. Remove the four screws pos.1, holding the gear housing and the stator housing. Disconnect the gearbox housing and the stator housing. gear housing detaches together with rotor position 8. To remove the cover poz.23 gear, it is necessary to unscrew four screws poz.24. Poz.33 driven spur gear fixed to the spindle shaft by means of tabs at 26 and chafing stripper poz.25. Bearing poz.21 removed stripper. Feature bolgarok family Makita is quick protective casing poz.19. Makita grinders firms are more likely to come in for repair. But the reason in a high percentage of fakes, flooded the Russian market. This Makita is a reliable, durable tool. But, like all Angle grinders, It suffers from the failure of the gear unit, its gears. By replacing the gear reducer resort in the event of jamming or fracture. 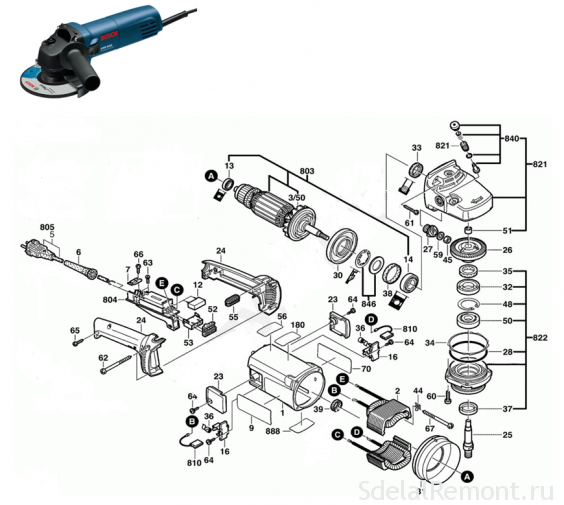 To repair Makita angle grinders 9069 see или 9558 HN, you must disassemble grinders. If nespraven reducer, and it is determined by the appearance of the backlash of the spindle shaft, jamming gear, stalling driven gear, it is necessary to disconnect the gearbox from the stator housing. Free carbon brushes poz.35, remove the four screw position 10 and disconnect the gearbox housing from the stator housing poz.37. In the next step, remove the four screws poz.18, holding the rotor cover poz.15. Driven gear pos.14 removed with the help of a Persian. Pinion poz.43 secured due key connection and the fixed nut poz.42. the rotor shaft bearings pos.3 removed using pullers. Among domestic manufacturers of the special place occupied by the production of such well-known brands, as Interskol, Fiolent, Lepse. For proper operation of the Bulgarian Interskol can work for years. Along with infrequent failure of the gear grinders, wherein the weak link is a pair of gears and bearings, marked instances of faults in the stator. To replace the gear reducer gearbox housing must be disassembled poz.19, releasing cover pos.6. Driven gear pos.11 pos.8 pressed on the shaft and is removed by means of a press. Bearing position 9 is removed stripper. 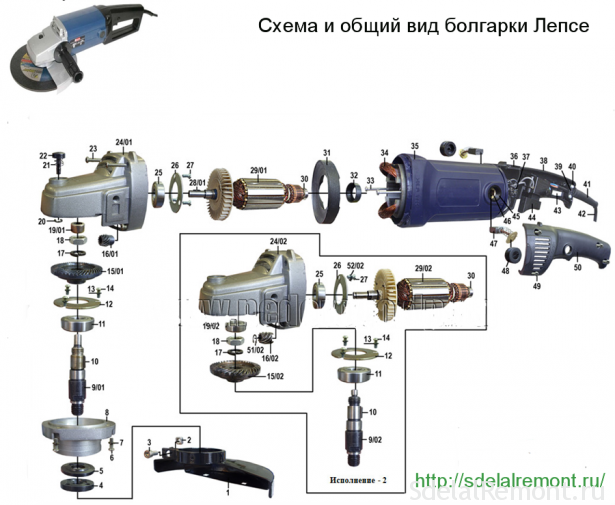 Stator Repair grinders Interskol can be performed independently, if you know the required data. When disassembling the burnt stator you have to count the number of turns of wire used, its section. Bulgarian brand labeled LNA Lepse Lepse Kirov 1.8-230-A. These grinders trace their history to the famous Bulgarian Soviet-made IL. Surprisingly hardy tool, represents the anti-vandal construction. Advantages of grinders Lepse consist in the possibility of replacing worn-out carbon brushes without disassembling the machine casing. Repair LBM Lepse in terms of replacement brushes is simple. Through special windows poz.45, stoppered, capped poz.48, poz.47 carbon brushes are inserted into the housing of the brush holder poz.46. When repairing gear grinders Lepse have to dismantle a gear pair. Leading small spur gear mounted on the rotor shaft and fixed to the spline nut. Poz.15 driven gear position 10 is screwed onto the spindle shaft and fixed nut poz.18. In recent years began to enjoy great popularity Bulgarian Phiolent. It attracts not only an affordable price, but also a reliable tool. Repair Bulgarian Phiolent own hands is recommended to start with an examination of emerging faults. If you need to disassemble the grinder Phiolent, then to remove the driven gear pos.11, it is necessary to press out from the shaft of the spindle position 8. 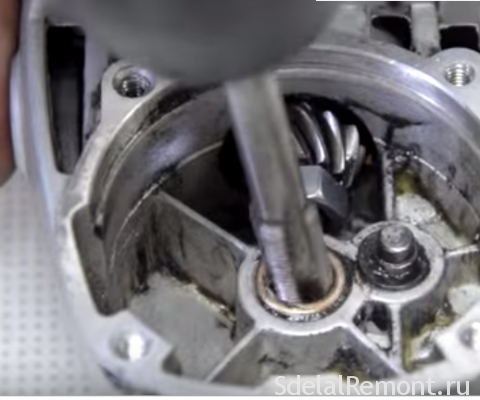 To remove the bearing spindle shaft, previously necessary to remove a large helical gear. This is a minor inconvenience. Replacing rotor bearings interfaced with the, it is necessary to remove a small helical gear poz.22. Although the Bulgarian and is not a tool of particular complexity, perform a repair operation, the user can not be on all nodes. Along with the simple replacement of bearings or gears the gearbox has such a fault, which can not be made without special tools or equip. For Extrusion driven gear you need to press. reel rotor without adaptations fail. These faults relates failure of the rotor. For a mere consumer of such a failure ends going to the service center. Advanced users can restore the burned rotor, having certain skills and concepts. But sometimes it's easier to buy a new, what to do rewinding. For most users, grinders repair their own hands is limited to a certain range of faults. The simplest fault, of which do not include Bulgarian - broken supply wire. Most often, there is an open in the power cord near the plug or in the instrument input. The fault can be easily eliminated by replacing the power cord or removing the broken wire pieces. Strengthening of the heating installation in the area of ​​carbon brushes. Most often, this error occurs as a result of shortening of the carbon brushes is less than the nominal size. Carbon brush length can not be less than 8 mm. Ceasing Bulgarian power button. The fault is associated with burnout in internal contacts button. Eliminates complete replacement of the switch to a new. In some models LBM applied device, allowing smoothly adjust the speed grinders. 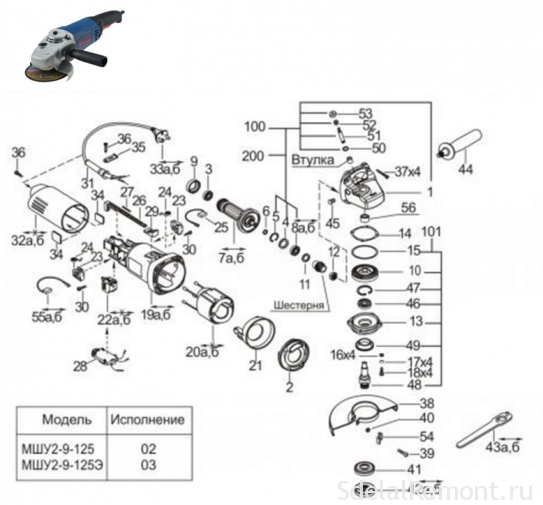 LBM speed regulator improves smoothness enable Bulgarian and warns zakusyvanie working body. Repair LBM speed controller is its complete replacement. The emergence of extraneous noise in the gear grinder, heating gear. 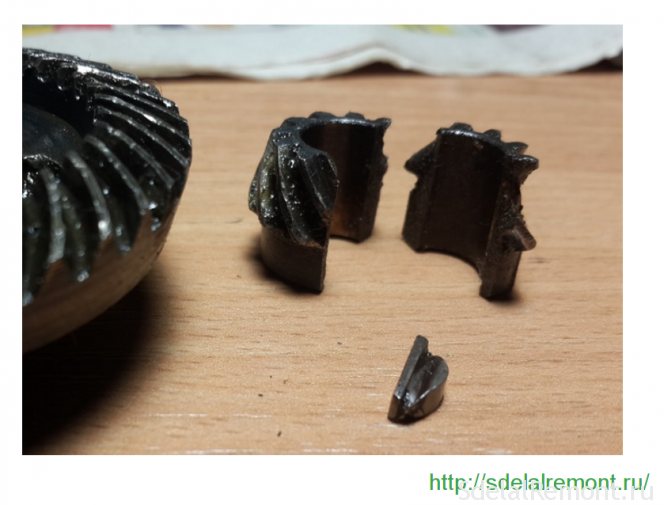 The fault related to the destruction of the support bearing, wear the gear teeth of the gears, drying of lubrication. It eliminates the replacement gear tooth wear at high. With a slight deterioration of gear tooth can try to fix it. The tooth profile is corrected manually, pripilivaniem using a round needle files and drills. Lubrication is replaced by a new one each time the gearbox repairs. New grease is applied to the thoroughly washed details. Bearing replacement is required for its destruction, or the appearance of a large backlash. In some models on the spindle bearing planted with interference. Replacement requires special tooling, in particular, press. Items must be cooled or heated. Replacing the bearings on the rotor is required when a large run-out. The presence of high heartbeat easily visible on the rotor and a collector for the carbon brushes wear rate. If you are clicking on the "Start" button will not turn on Bulgarian, the test start with a tour of the power cable to the input position in the tool. Unscrew grinder and check the integrity of the power cord using tester or phase. Always follow basic safety rules. If the power cord is intact, and the Bulgarian is not included, replace the "Start" button. If the installation of the new Bulgarian button does not work, check the quality of attachment of the carbon brushes and a snug fit to the rotor manifold. Jamming or destruction of bearings. Licking or destruction of tooth gear reducer. Open or short circuit in the rotor or stator. Failure of parts of control circuits. The destruction of the gearbox housing. The reliability of the gearbox and its longevity is largely dependent on timely replacement of lubricant and its correct selection. In the Russian market of petroleum products is a wide range of lubricants. Among them are Russian manufacturer of lubrication. Modern manufacturers of tools is strongly recommended to use only lubricants of own production. It is the policy maker. 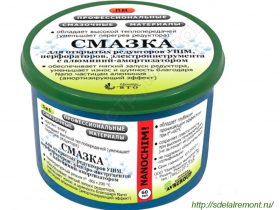 Of Russian lubricants recommend the use of lubricants specially designed for gearboxes. But the quality of the Bulgarian work affects not only correctly selected lubricant, but mostly it timely replacement! Do not tighten with the lubricant replacement, monitor her condition. Video: Repair grinder with his own hands.